Last week the UK Passenger Shipping Association released its annual cruise review, revealing a number of interesting trends in the UK market. And some lines have started to re-introduce fuel surcharges as the price of Brent crude rises. Meanwhile, fuel surcharges have started to return and Hurtigruten and TUI Cruises are looking to adding new ships. It is now five years since the UK topped the 1 million mark and Germany is surpassing it now, following the UK for second place. Much further down the list, the third European power, France, can hardly muster 350,000, although there are some signs that that market may take off yet. In addition to the 30,000 who paid more than £5,000 each for their cruises, there are another 200,000 who paid between £2,500 and £5,000 a head. Much of this growth resulted from the more upmarket lines such as Crystal, Regent, Seabourn and Silversea adding value to their product with free flights, free shore excursions and massive on board credits, as well as new ships. Compared to the 15% who paid above £2,500 for their cruise, fully 36% paid less than £1,000, down from 40% five years earlier. And another 37% paid between £1,000 and £2,000. Cruise durations at the same time have risen from an average of about 9 days to closer to 11 days as cruising has caught on again in the UK. 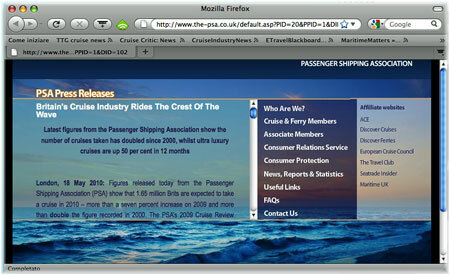 UK cruising has grown from about 30% of the total market in 2004 to almost 40% last years as more and more ships come to be based in the UK, not only from the traditional lines such as P&O, Fred Olsen and Cunard, but also from newcomers such as Royal Caribbean International and now Celebrity Cruises starting this year. Cruises to Northern Europe have grown by 20% in the last five years while those to the Atlantic isles dropped 6% and the Mediterranean 2%. And cruisers continue to use travel agents to book their cruises, with 80% doing so, some perhaps after doing their research on the internet. Fully 25% of cruises in the UK were booked face to face in 2009 and 38% by telephone, where for the year previous it had been 29% face to face and 40% by phone. On line bookings made through travel agents, however, rose from 9% to 17% in one year, a remarkable increase, whereas online bookings made direct with cruise lines only rose from 11% to 12%. But perhaps most remarkable of all in a year when people were said to be holding off until the last minute before committing to spending, those booking a year or more in advance rose from 18% to 25%. Equally, last minute bookings (bookings mad within three months of sailing) fell from 26% of bookings in 2008 to 17% last year. This seems to run counter to what many travel agents and cruise lines had been saying about the booking window having narrowed because of the world recession. Interestingly, the proportion of first time cruisers dropped while repeaters kept the lines in business and the market growing. Fred Olsen Cruise Lines is the latest to increase its fuel supplement, to £3.50 per person per day, with a maximum of £70. P&O Cruises and Cunard have recently also announced fuel supplements of £2.50 per person per day, up to a maximum of £100. These have been put into effect on all new bookings made since May 10, and apply to departures from November 1. No supplements apply to bookings made before May 10. These were followed by similar hikes from Norwegian Cruise Line, Royal Caribbean International and Celebrity Cruises, all in response to the recent rising cost of oil. NCL charges £4.50 per person per day with no ceiling. Royal Caribbean and Celebrity charge £4 a day, with a maximum of £56 per cruise. At the other end of the scale, however, Swan Hellenic's fuel surcharge has leapt from £2.50 per person per day to £14 per person per day. News came out of Norway last week that the now-united company may be planning new ships, but in a methodical fleet replacement program rather than in bunches as has been the case in the past. Hurtigruten now has a fleet of a dozen ships, eleven of which are engaged in the 11-day daily mail route between Bergen and Kirkenes, near the Russian border. The twelfth is the company's Greenland and Antarctica ship Fram. While the Fram is the latest, commissioned in 2007, the newest ships in the fleet were commissioned in bunches, the Finnmarken, Trolljord and Midnatsol in 2002-03, Nordkapp and Polarlys in 1996 and Richard With, Kong Harald and Nordlys in 1993-94. But the idea now may be to order ships sequentially so the company is not laden with huge debts to pay for new bunches of ships all at the same time. 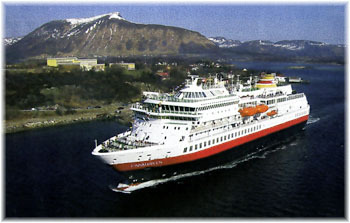 Two of the company's ships, the Nordstjernen and Lofoten used in Svalbard and on the coastal route, are each about a half century old, having been built in 1956 and 1964. These could be the next up for replacement. 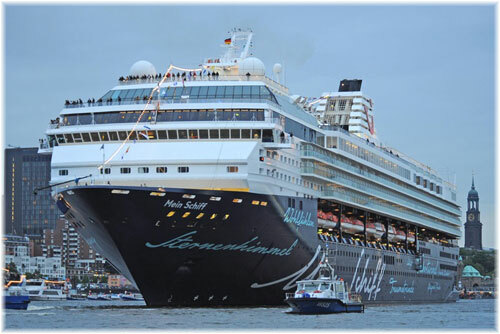 With reports that two ships, Mein Schiff and Mein Schiff 2, are scheduled into Copenhagen in 2011 and with TUI Cruises adding Mein Schiff 2 to its own web site in the near future, speculation has begun as to what ship will join the former Galaxy in the TUI Cruises fleet. Celebrity Cruises have already announced that the Celebrity Century would replace the Celebrity Mercury out of Baltimore next winter so it would appear that Mercury will indeed be the ship chosen as she is an original identical sister of the Galaxy, now Mein Schiff. She will no doubt be converted with the addition of the same suite of balconies hat has been added to Mein Schiff. The Century, the first of this trio of Celebrity ships from Papenburg was completed to an original design about 50 feet shorter than her near sister ships and has had her own different suite of balconies added.